This is the Titan architectural diagram. 1. 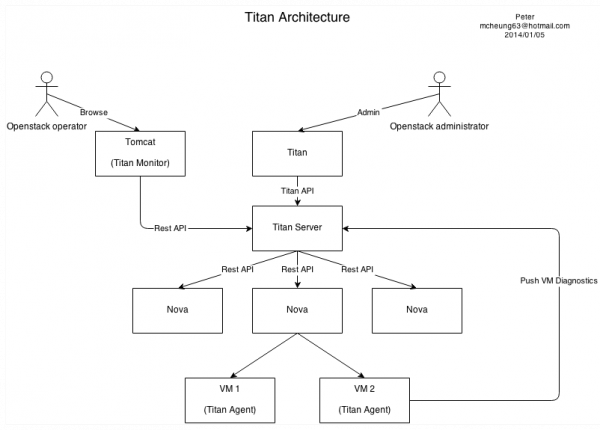 Titan Server – It is the core part of the system, it used to controls all openstack services (nova, neutron, etc…). The role of the titan server is to execute the command from Titan management tool. 2. Titan – It is a management tool for openstack administrator, we are pushing our limit to integrate all features from openstack, we hope it will be the one-stop tool for all openstack administrators. 3. Titan Monitor – It is a web based tool for people to admin openstack in mobile. It provides basic functions to admin the openstack cloud. 4. Titan Agent – It is a agent software run inside VM, it pushes diagnostics information back to titan server.